Just like Lazarus: David Bowie is reborn. The first time I heard Bowie was doing my “O” level revision listening to Radio 1 and I heard what I thought was the guitar part to “You keep me hanging on” which I liked as a song and it turned out to be someone called David Bowie singing about a Starman, in a sort of cockney voice a la the Oliver Twist musical and letting the children sing. I rather liked it. A female friend then had Hunky Dory and I thought it all very nice. Slightly wierd but Life on Mars was good. Then I saw him on TV – convenient – and after that DB was a complete and constant influence south of the Watford Gap as they say here in the UK. Everything you did was judged alongside Bowie and that was that. there was – is – a sort of Cult of Bowie, whether he likes it or not. But Starman is very beautifully recorded – pop style – but Ken Scott as production engineer and Trident Studios? That’s a good plan, as I know now: I knew nothing about it then. That’s cash. And strings. So that’s an arranger. ‘Spensive. I didn’t know that then. I couldn’t stand Glam Rock. I was right. But money prevailed for a while. But from that time, south of the Watford Gap, DB was Disco King. Warped and cracked, on might say, but King. Talented guy. Colorful and interesting in every way. But there’s Steely Dan; Stevie Wonder. 10cc! Tamla. Talking Heads. Peter Gabriel….The Stones! But no. Everything was David Bowie. South of the Watford Gap. I’m sure that’s because he spent a great deal of money south of the Watford Gap hiring people. The “factory System” like Warhol has been used since Renaissance times and before. DB used it. I’m all for it. But no. DB is special, he’s something special, etc. Etc….etc…. So there was a bit of a Bowie mania thing that prevented sensible discussion about his records – but given how much DB spent I can see why. So he had influence, even power, in this geographical and professional area. He was an empresario. He financed other acts. Clever. Talented. Slightly wierd stage persona, probably influenced by his brother, but a very talented chap all round. The nearest I was to it all was through Robert Fripp who I met in 73/4, but the whole DB thing was like a secret subject. It was a bit of a culty thing, but that’s after the event anyway. While I was learning production engineering with Tony Arnold DB was the Thin White Duke playing slightly wierd funk in America. Sounds expensive too. Very. Couldn’t play lead guitar though. I’d like to have heard that, but I assume it would be Fripp-esque. Fashion. That’s another good one. Then there was the Ashes to Ashes video. I see what he’s doing but still a bit wierd. Nothing wrong with that. He went to New York. After that he seemed to become slightly more distant but still his influence was dominant in the uk music south-of the-watford-gap scene. Not in the public culture but in the business, as they say: behind the scenes. L’eminence gris. So I think it is true that, as a music person south of the Watford Gap, DB had an enormous influence beyond anyone else because of the number of people he worked with (as they say) and quite right too. I happen to like wierd. It’s existential. But Bowie, David Jones, wasn’t wierd. He was just intelligent. And it’s all entertainment. Some people seemed to go for it hook, line and sinker. I didn’t but I like it. That damned me to hell, so to speak. That was the extent of the belief. Slightly exaggerated, fuelled by too much cocaine, I would think now. So, I liked his art work and arty stuff. He made 111 singles and 28 studio albums. never mind the other stuff. That’s amazing. The king is dead and I can feel the ripples as a result. There you are. Probably not so significant in other places but south of the Watford Gap? Very much so. Actually I liked Where are we Now, I think that’s good especially recording-wise and Lazarus the song is good, the recording is very detailed in an un-detailed way. But Fame says it for me: funky, but in a wierd way! I think I should put on record the sad death of David Bowie. I’ll talk about it later. I really must keep up my blog: in any event a video of “Hole in my Heart” is on its way. I don’t quite know why suddenly all the professional types are being so helpful and actually know what they’re doing perhaps it’s just one of those things, perhaps it’s the effect of the new arts and music colleges but the director asked me for a brief, I gave them the brief and to all intents and purposes there it is. It looks great. The world has lost a great comic for endless years. Ah well, it hasn’t been so bad for me….. So now I need to write a script for 2084, weave a love story between Magdalena and Spencer, fit in the songs from Romantic Fiction and make a movie. It’s that easy! See you in Tinseltown!! I was born in Ash, Surrey in 1955 but grew up in St.Albans, Hertfordshire, home of the famous Magna Carta, from 1957. So I was filled by the locals with lots of constitutional zeal and individualism in the sense of “thinking for yourself”. As Robert Wheeler-Pemberton I come from a comfortably well-off family. I loved school and did well. My grandfather and his brother and the rest of the family had a factory which still stands in Tottenham. He was an electrical engineer and designer and inventor – as well as buyer – my uncle was the accountant. They came from a large, successful family of 22, by two wives. Steven Wheeler in Wallingford had married Miss Cooper in Wallingford and they sold up and started a chandler’s shop – boat suppliers – in Old Street, Hoxton, London in about 1844. They gave rise to two Wheeler brothers who were both tailors and John Cooper-Wheeler, father of 22, gave rise to my grandfather Arthur Wheeler who went to the Regent Street Poly, worked for Edison at Ediswann’s in Enfield and set up electrical power systems everywhere including the tailors’, joining the electricity to the new “sewing machines”. So I grew up in an environment of innovation and cash-making! My grandfather was an enormous influence on me. He taught me how to set up production systems. He built the lighting for the first Heathrow Airport. He invented or designed the light-dimmer and designed the first starter motor for diesels on ocean-going vessels, circa 1915, when he was in his thirties.He died when I was 19. He was 95. My grandparents lived in Winchmore Hill, near Enfield, in London in my childhood and then moved to Canford Cliffs in Poole Dorset. I duly followed with my mother and went from there to London until I got my own place. I wanted my own production system. I wanted to make things. I decided on – amongst other things – R&B records. I wanted to write and produce R&B records. Firstly Robert Luther Smith doesn’t exist. Luther was a creation by myself, Robert Pemberton to play the part of pop singer in a band in 1973 which went on to be successful both as The Hit Men and then Zen. Luther is a singer. I got called Luther because people thought it was my name by virtue of my family life at the time. It was partly because of the self-confident way with which I express my views but I found it useful: people know who Luther is easier than a Robert because people always say “Robert who?”. There was – and remains – the usefulness of being called Luther: people know who you are immediately. However after 1982 another singer came along with a similar name which required greater distinguishing on the Net, so Robert Luther Smith was re-invented. 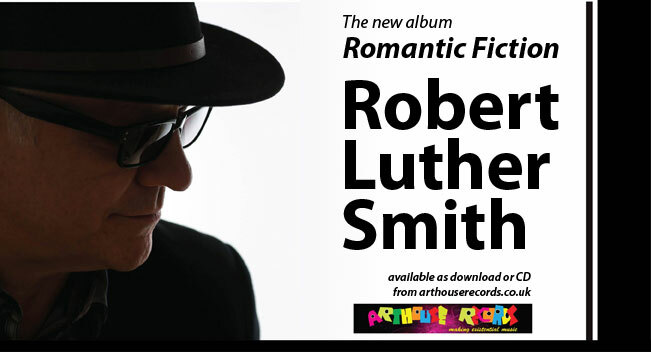 I thought about Luther Smith and Robert Luther but settled on Robert Luther Smith, partly because it was long and so more noticeable. I was brought up by my grandparents on classical music, mostly Beethoven and Mahler and the like, my mother liked Sing Something Simple and the Ray Sammes Singers which I though lacking depth, although I liked Gigi. Then in 1960 I heard “Let’s twist again” on the radio and noticed the bass drum. My grandmother bought me the singles. She bought me all my records. I became interested in beat music. I liked the Beatles and then came Jimi Hendrix. Then came James Brown at No 1 in 1970, then came Steely Dan and Elliott Randall’s solo and Stevie Wonder’s set of early 1970s albums and I was off. I started recording in the mid-sixties when I was 10 with my brother’s reel-to-reel (musique concrete, mais oui!!) and first recorded at Regent Sound in Denmark Street London, in early 1974 for Jim Flynn at Charisma. Then I worked with Tony Arnold in his studio from 1975 (The Hit Men” album, including “Red Day”) and then moved on to Red Bus Studios in London in 1982 (Electricity, I’d Rather Be, Go!) and that was it. Steve Levine was working next door, I was touring with Hot Chocolate – which was a good choice by the promoter in retrospect – and I was in the middle of the UK pop scene. Spandau Ballet and Culture Club were all the rage. I was there. Then the real work started: staying up there. I worked in several studios, including Room with a View, Misty, and several in London that I can’t remember. All through this time I worked with many, many musicians starting from 1973. I gigged continuously from 1973 to 1987 when I was ill with M.E. from over-work. I always fall ill when I work too much and that has been my major issue: I run out of energy, or rather I did (1978, 1987, 1998, 2008). In 1987 I was ill: the circus left town. Ciao. I started writing books as well as music, although music took most of the time. In any event I recorded “Theory of Rhythm” in 1990 which included “Portland”, one of my best musical allusions and “Filling you up”, which is fabulous. If you got two good tracks on an album, you’re doing o.k. I was never particularly interested in pop fame and I came to see it as a poisoned chalice: I can only admire the strength and fortitude of those can survive that corrosive lime-light. My only interest is making good R&B records and I think I’ve achieved that. The rest is marketing. Now I have extremely helpful people that work all the computers. I’ve always been into electronic music and I’m proud of the fact I’ve made sequenced music sound real. Art has many facets, after all. Using computers is much less stressful and energy-consuming than gigging and touring and I have to accept my physical limits. In 1998 I used tape for the last time (Funkygroovy, Pop Art) and went entirely over to digital, learning it myself first in my home studio (Fly White Guy album (2003), Art Pop (2009)) and then finally finding someone to work the tech, to wit production engineer and producer David Thomas and so “Romantic Fiction” (2015). I’ve never been more pleased with the outcome of an LP than Romantic Fiction and I look forward to the next, provisionally called “Pop Fiction”. On Romantic Fiction I wanted to go back to scoring the music and thus found Kieran Marshall M.A. Who brough me up to speed on scoring and then left me well behind on Sibelius, the scoring computer programme which allowed us to copy, paste and edit to our hearts content and create the arrangements, with the benefit of being able to convert the Sibelius program to MIDI and then put it into the computer recording software with Dave Thomas and go from there. Still Romantic Fiction took two years and I had to work with people to do it who are both musicians but with computer skills. This is the future for me at least, although I still want to use musicians on recordings where I can. That’s my life so far and there’s way to go….